@ActOut Call Trader Joe's HQ 626-599-3700, ask 4 customer service re. Bike Parking at Hollywd/Vine. Then tell them 2 get bike racks 4 grand opening! Friends from far and wide, on Twitter, on Facebook, and on MySpace, picked up on the alert and began calling Trader Joe’s. In spite of both of our requests for a call back, we never received one. Instead, we all called the corporate headquarters and were typically transferred to Tiffany who took the message, indicating that she would pass the “bike rack requests” on to Christy Hughes, District Manager for the Hollywood store. Her tone grew gruffer as the calls continued. 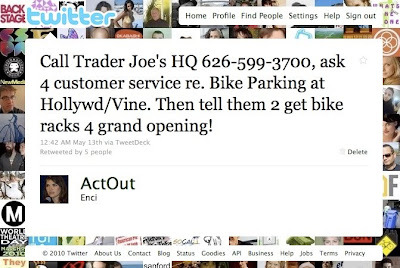 @DudeonaBike RT @BikeWriters @ActOut: Call Trader Joes HQ 626-599-3700, ask 4 customer svc re Bike Parking at H'wood/Vine. Tell them 2 get bike racks. Gary Kavanagh From my experience Trader Joe's has never been especially bike friendly. The Santa Monica location only has a cheap wheel bender rack, but not only that, it is one made for 26" wheel size, my 700cc road wheels don't fit in it. I usually attached to the hand railing by the door, but now I pretty much only shop at the Co-Op, the only grocery store in Santa Monica with a proper bike rack. Ron Durgin Just another example of how this TOD project fails the community and fails to meet minimum standards. TJ's offers a feedback form for local stores on its website, including H & V. I say we hammer them with feedback about their failure to accommodate cyclists, especially with a planned opening during Nat'l Bike Month and Bike to Work Week. Numbskulls. Jeremy Grant I did this and the girl (Tiffany?) sounded a little perturbed... She said "yeah, all your friends are calling". So I layed it on extra thick and had her write a bunch of techno mumbo jumbo down after I gave her a ton of reasons and then started quoting the code book. So fun. Crispin Oochie I thnk it kinda starts at this juncture.....new building, new parking....they wont do it unless we ask, petition...demand! I'm not ready to take on a project, but I will call them and say WTF? No bike parking? Guess I'll shop on sundays at the farmers market! Eric Pancer They always come up with some statement like "the bike racks weren't ready yet". Brian Bell I've always been amazed at the lack of bike parking at TJ's. Ana-Maria Lupan bike parking especially in that busy area will result in bike PARTS still being ripped off ;( ... in-store parking/walking bike in is the only way to do it these days in busy areas. @Ride_the_Bone RT @ActOut: Call Trader Joe's today at 626-5993700 to ask them to install bike parking by May 21, grand opening of H'wood/Vine. Kevin Winston It's Trader Joe's, they better! Jonathan Weiss Our closest TJs has 1 beat-up rack and it's kind of hidden. Let us know if you make progress. 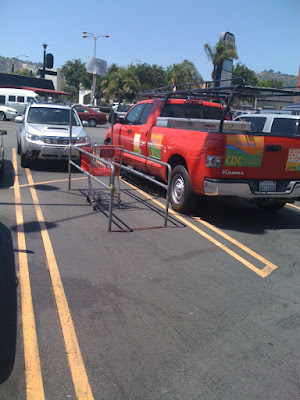 A couple of phone calls to Topa management for the shopping center at Sepulveda & National got us the first rack there. That's my shout out. At some point in the conversation I was able to convince her that I was clear on the agency who owned the land (the Metro) the agency who controls the sidewalks (Building & Safety) the landlord (Legacy Partners) the local development partners (CRA and City of LA and CD11) and the people who advocated years ago that the W Hollywood complex come with a 1) Bike Share program 2) a Car Share program 3) a local delivery service. Now that the W Hollywood was open and the promised community benefits have failed to appear, it is us (the cycling community) who are still fighting for transportation innovations that all start with the simple accommodation of cyclists. BIKE RACKS! At this point, Hughes tried a different tack, letting me know that she didn't know why bike parking was her issue anyway. "I called our construction coordinators to find out why bike parking wasn't a standard operating practice." This was progress because we were moving past the "Corporate Denial of Responsibility" that I heard from the Construction Manager, two Store Managers, and one Customer Service handler. I urged Hughes to go beyond a simple request for bike parking and to actually hire a professional to survey the property, to specify the appropriate racks, and to supervise the installation. I pointed out that well meaning operators often put in bike racks, selecting the wrong type and then installing them incorrectly and in bad locations. Hughes rejected my request along with my request for a call back to confirm that bike parking would be part of the Hollywood Trader Joe's facility. She went on to explain that it was all unnecessary, after all, "I'm a cyclist myself. I even drive a hybrid!" The "Wave" rack or "Ribbon" rack that was previously installed with finger tight bolts that offered no resistance to bike thieves had indeed been moved, this time to a spot that was equally bad, perpendicular to the curb line and blocking the walkway. Apparently this was why it was empty. It is unprotected space, it creates conflict with both motorists and pedestrians, and it simply fails to entice cyclists to use it. 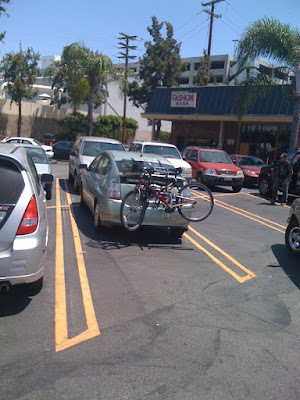 Meanwhile, cyclists arriving at the West Hollywood Trader Joe's demonstrate with their behavior that the best location for bike parking is within sight of the front door. Here the cyclists have demonstrated that they would rather lock their bikes where there in no ped conflict, even if it means locking it to a pole or a tree. I mentioned to the manager that there appeared to be a fair amount of bike traffic in the area and that a Bike Corral might be a great solution, a parking space that is set aside in the parking lot with bike racks, a very efficient solution to the lack of sidewalk space for bike parking. "John" assured me that using any space in the parking lot would be a big problem because they had no control over the parking lot. "We're just tenants!" 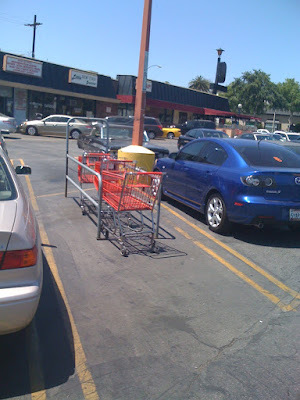 This restriction is simply contradicted by reality as is demonstrated by the fact that shopping carts get three "Cart Corrals" while bike gets snubbed. 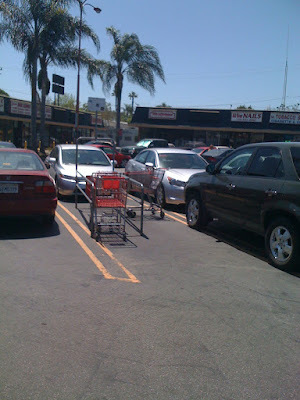 As for the claim that Christie Hughes made regarding improvements to the bike parking at the West Hollywood Trader Joe's, I think I discovered her solution. It appears to be a Hybrid with a bike strapped to it. As of today, Ed and Sandy, the local managers of Trader Joe's assure me that there will be bike parking, 8 racks with space for 16 bikes, inside the parking garage and accessible through the Vine Street breezeway, just outside the P1 entrance. As of today, Ed Kirk, the Construction Manager of Legacy Partners, says that they are restricted by the Metro/CRA Development Agreement from putting bike racks outside the building. I pointed out that Metro and the CRA are purportedly proponents of bike parking and that he acknowledged that bike parking made sense, but that he operated under such harsh restrictions that they did what was required and that we would need to go the Metro/CRA for approval. Ultimately, he said that if it's okay with the Metro/CRA he is open to discussing bike racks on the corner of Vine and Selma, all he asks is that they be attractive, that the process for permitting be painless, that somebody wrap up the proposal and take responsibility for funding it. 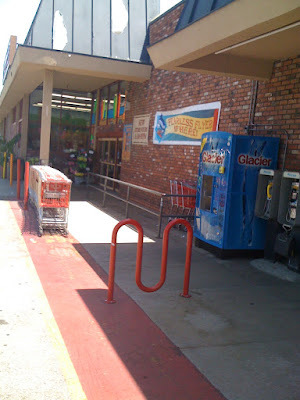 As for tomorrow, the last day of Bike to Work week, Trader Joe's has promised that bike parking will be a part of the grand opening celebration for the 13,000 square foot store at the corner of Hollywood & Selma. Ride on over and join us in cutting the ribbon on those bike racks!